We’re through week two since the Lingcod opened on March 10th and fishing is as expected…outstanding. Limits of Lingcod (2, any size), and limits of Rockfish (7 total) have been the norm for the All Rivers & Saltwater Charters team. Our fishing program is as fun as it is productive with the use of light tackle and live bait. The use of live bait also yields a nicer grade of lingcod which has made for heavy bags of fillets at the end of the trip! Our go to set-up for the Seabass is a lightweight 7’ Okuma Tarvos spinning rod, 50# Tufline braised line, and a double dropper loop rig with shrimp flies. Tons of fun. We’re focusing on bottom fish out of Westport through May and as June approaches we’ll be looking for Salmon and Albacore. Salmon fishing has been good in Area 6. Blackmouth have been caught up to the mid-teens in weight. 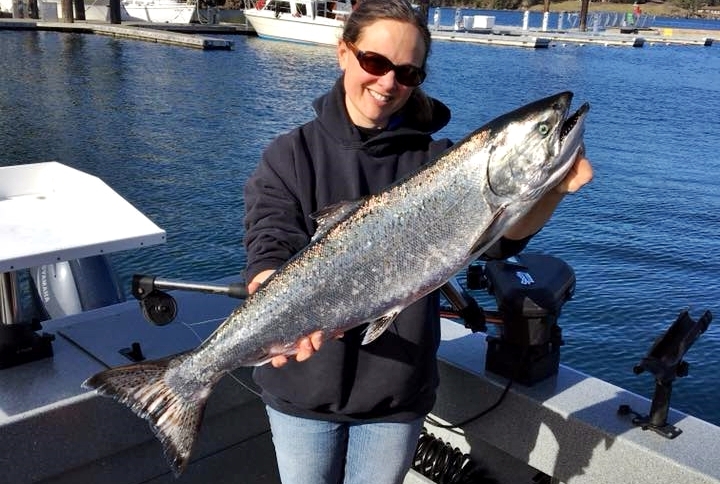 Fishing for Winter Chinook has been fair in the Islands. There’s a mix of larger and smaller bait around. The salmon are spread out so it may take a few tries at different spots o find them. THE BANKS! There are some very big herring this time of year on the banks (Mid-Channel/Hein/etc) and they are attracting some very nice Springers and Blackmouth. The herring size is 6 to 8 inches (Black Label) so no need for Coho Killer spoons in these areas. Go big to go home with your dinner! See you on the water! a Silver Horde Tailwagger spoon 36″ behind a Pro-Troll Flasher. Area 9 is still being plagued by shakers, but also has catchable Blackmouth in the 4-8 pound range. Fish the bottom 20 feet of water in the 100-140 ft depths on the incoming tide. The Pilot Point area seems to be good. On the outgoing tide Pt. No Pt to Skunk Bay has been a steady producer. The Port Townsend area has less bait than before and the fishing has slowed in that area. Silver Horde # 4 Kingfishers and Tailwaggers in Glo and UV colors are the go-to for catching larger Blackmouth. The salmon fishing picked up over the weekend with the nice weather, Blackmouth/immature Chinook were caught at the Clay Banks and Pt. Dalco in 140-170 feet of water at the low and high water tide changes near bottom trolling flasher and spoon, Jigging with salmon jigs and mooching with herring. Also there are some Coho to 16” and sea run cutthroat trout being caught with light gear along the shoreline mostly in MA 11 and 13. Most legal salmon are in the 4-6 pound range with a few up to 10 lbs. Call for a more updated report at (253)404-3960. The northern end of Area 12 from Dabob Bay to the Hood Canal bridge is still putting out a few fish in the 6-12 pound range. Salmon fishing was GOOD. Anglers have been having the most success on the top of the flood tide in Whirl Bay. It’s been slower inside the ban and near the marina. Most anglers are fishing close to the bottom in 100 to 140 depths. We haven’t heard of any salmon over 10 lbs here this past week. The majority of anglers are using spoons with Coho Killers, Gibbs Skinny G’s in green/glow and green/silver colors the favorites. The GIBBS Highliner Guide Series Outfitters, Madi, Lemon Lime and Green/Glow Hot Spot flashers have been working well. Hootchies in White, Glow/Green and Purple Haze are the top choices in plastic baits. 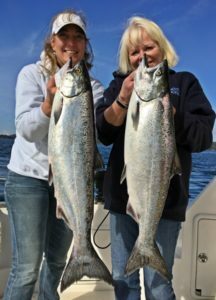 Pedder Bay Marina reports GOOD fishing in Whirl Bay. 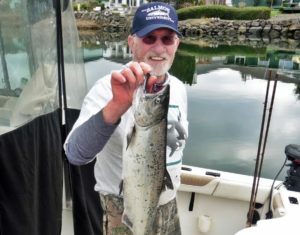 The largest salmon of the week was an 18 lb hatchery spring caught by Bob Gicas in Whirl Bay. He was using an anchovy for bait. It’s been slower near the Green Can at the mouth of the bay. Most of the fish have been caught close to the bottom in 100 to 140 feet of water. The majority of the salmon have been from 3 to 6 lbs in size with the occasional larger chinook.. Spoons have been producing the best and the Skinny G’s, AP Tackleworks and Coho Killers are the top choices. Green with either silver or glow has been the color choice in spoons. Hoochies and squirts with a green and glow, or UV white have been popular color choices for plastic baits. Flashers that are popular include the Guide Series Madi, Outfitters and Lemon Lime. Mark Lister with his derby winner! Salmon fishing was FAIR in the Sidney area. 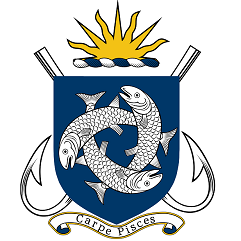 We have heard that there were some keeper springs being caught near Moresby Island and just south of James Island. Anglers using spoons found that APT Sandlance spoons, Coho Killers and Gibbs and Needle G spoons the most productive this past week. Suggested colours are Kitchen Sink and Irish Cream. Anchovies and Tiny Strip were also good producers of fish with teaser heads in Glow or UV Purple. The Mill Bay Marina held their annual salmon derby this past Saturday. Mark Lister won the derby with his 13lb 8oz salmon and took home the first place prize- $1,000 cash! Four fish over 10 lbs and roughly 18 fish were weighed in. the weather was great weather and a good time was had by all. Mark Lister won the Mill Bay marina derby with his 13lb 8oz salmon and took home the first place prize- $1,000 cash! The salmon fishing has been FAIR over the last few weeks. Most of the fish were from 3 to 8 lbs in size with the occasional larger one. The best location to fish for winter springs was from the Bluffs to Muir Creek. Most of the salmon are close to the bottom in 100 – 140 feet of water but there are some at mid water depths. The most productive lure combo has been a white hootchy fished behind a Red/Gold flasher. Hootchies in White, Glow/Green and Purple Haze are the top choices in plastic baits. Spoons such as Skinny G’s, Coho Killers and 3.5″ G Force spoons have been good. Anchovies are still the most popular choice for those fishing bait. Good choices for teaser head colors are Army Truck, Bloody Nose and Purple Haze. For flashers, Red/Gold Hot Spots, the Delta Guide Series UV Moon Jelly, Madi and the Lemon Lime Chartreuse are popular. There were very few halibut caught over the weekend. Fishing for salmon was FAIR off the waterfront this past week when the winds weren’t too blustery. Most of the fish are still small, from 3 to 7 lbs in size, but a few up to larger ones have been caught. It was best for numbers of fish out at Constance Bank. In closer, there were springs from the Flagpole to Trial Island. Wayne Zaccarelli landed a 13.5 lb spring near the harbour on Monday. In most locations the best depths to fish were 90-140 feet but we’ve heard of some larger fish being caught at mid-water depths. Spoons have been successful in getting hook ups with Irish Cream Skinny G’s, Green/Glow AP Tackleworks Anchovy 4” spoons and Green/Glow Coyote spoons popular choices. Most of the boats out fishing were not after salmon this past weekend as the emphasis was on halibut.